We haven’t talked about exercise in foreverrrr. I’m kind of in a weird space about it. I’m still lifting weights — I do a simple routine of box squats, presses, rows, and back raises — but other stuff has been in flux lately. Namely, I can’t really find a hot yoga space I like in San Diego. That’s such a weird thing to say, to be clear. It’s like saying you can’t find a good lobster roll in Maine or a bad hairdo in the 80s or a racist in the White House. Like, San Diego kinda SPECIALIZES in hot yoga. But it’s all the slow and steady sort, whereas the kind I love is hot and fast and intense. So I’ve stopped really doing hot yoga at all, which makes me sad when I remember how much it changed my whole exercise game in Raleigh! Instead, I’ve been back to Zumba, which I haven’t done regularly since living in Charlotte. It felt like all of the Zumba classes in Raleigh were overfilled and frustrating. In San Diego, I’ve found a couple of Zumba teachers I really love and their class sizes are miraculously reasonable (I don’t think Zumba is as popular here). So I dance on Saturday and Sunday and sometimes Monday, and then lift weights 3-4 other times per week. That’s working out well so far (well, when I don’t have the flu) but I still hope I can find a hot yoga place that’s just right for me! If I could get my three favorite exercises going at once, that’d be a dream. What about you? How are your activity levels lately? What’s your exercise routine of choice? This Buttery Broccoli Bread won’t help with your exercise routine, I’m afraid, but it might help with dinner tonight. This is a recipe I’ve loved since I was a kid. We used to make it and load it up while it was still piping hot with tons of butter. Enjoy! 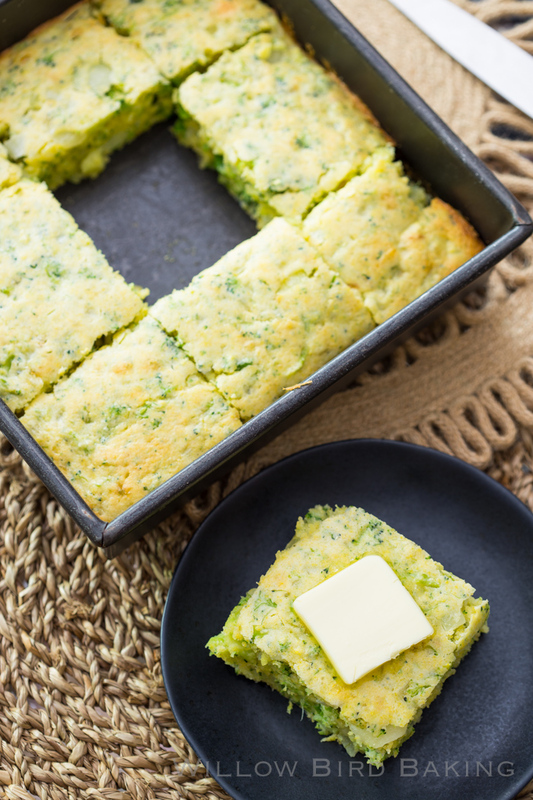 I used to make this Buttery Broccoli Bread as a child and serve it with huge pats of butter. 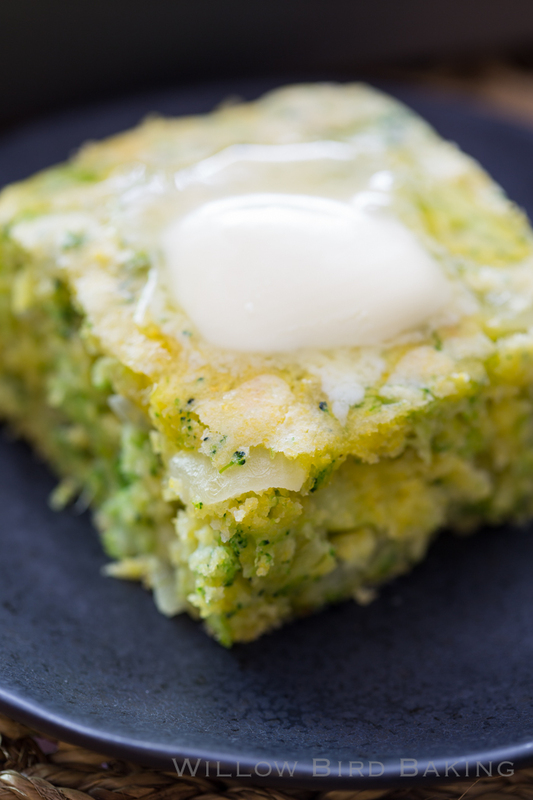 It's really broccoli cornbread, but we always just called it broccoli bread! A warm piece of this bread would be delicious with a slice of cheddar cheese slipped inside. 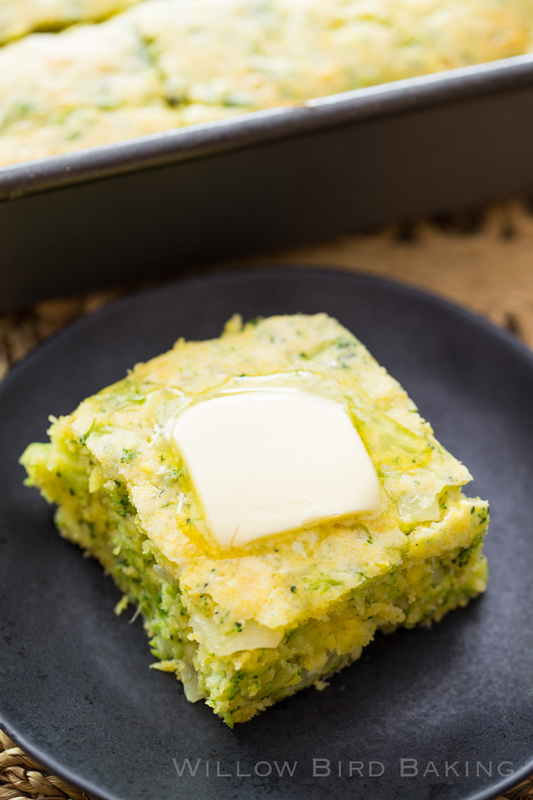 Preheat the oven to 350 degrees F and grease an 8-inch square pan with cooking spray. In a medium skillet, melt the butter over medium-high heat. Add the onion and sauté until tender and translucent but not brown (about 5 minutes). 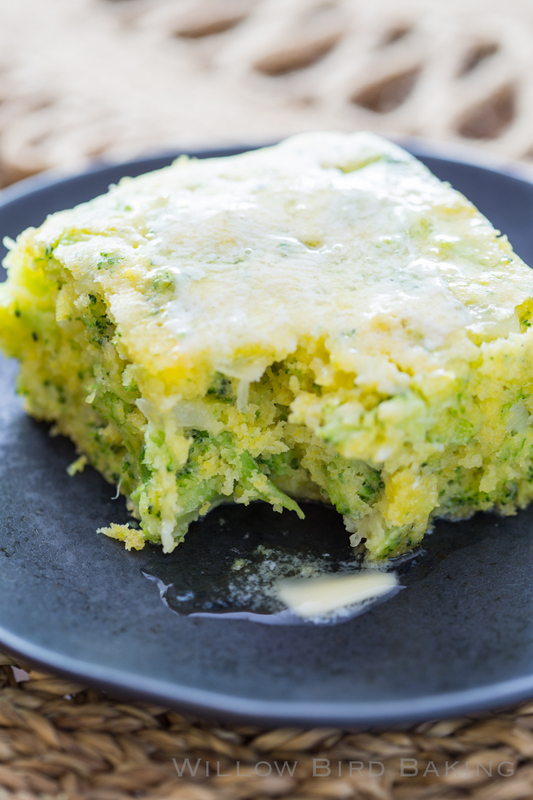 In separate large bowl, combine the onions with the corn muffin mix, eggs, broccoli, cottage cheese, milk, and salt. Stir to combine well and pour into your prepared pan. Bake 28-33 minutes until the edges are golden and a toothpick inserted into the middle of the bread comes out with just a few moist crumbs. Let cool slightly before serving warm with extra butter. I love cornbread in basically any and every incarnation. I’m excited about this! I can make cornbread and tell myself I’m putting a vegetable in it, hahah! I hurt my shoulder/chest muscle a couple months back and I’ve been doing physical therapy for it. On one hand, PT is great and very helpful. But the months of pain and stopping doing weights while I tried to figure out what was wrong sucked. So I’m just doing various cardio things five times a week, and three days of various PT exercises. I’m so sorry to hear you hurt yourself! I haaate being benched because of an injury so I know you must be so frustrated. I hope you’re back to 100% soon! Mine has been painting Laura’s new townhouse… all THREE floors! lol I really like Zumba but just do it at home. I think it would be a LOT more fun with other people.